A cube of soap belonging to the one known as TYLER DURDEN! 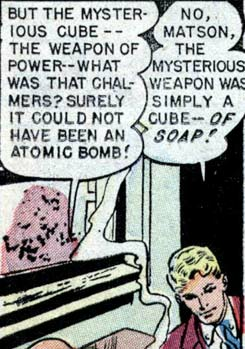 Bin Laden’s next nefarious plan is to hurl bars of soap at the White House. *bows* ty ty. Now if only that funny transfers over to the caption contest! I think it was him, at least. May have been another one. Yeah but these are thrown shoeicide bombs. Thankfully G.W.Bush has enhanced reflexes or he woulda sploded. Prison inmate tactics. They “accidently” drop the soap. When they bend down to pick it up, they secretly carve out a cube and “hide the soap”, which they later smuggle out of the prison when they get a conjegle(sp) visit.